With the strong and steady growth of the internet has come a demand for increased ability to use it for both voice communications and data communications. To date, the alarm industry is just beginning to catch up with advances in types of communications which allow reliable alarm transmission of signals to central monitoring stations. The dramatic increase in VoIP services has also brought strong demand on alarm companies to respond with more cost effective solutions, as clients abandon conventional phone services for internet voice communications products and services. Lately, alarm manufacturers have begun to respond with IP communicators that allow clients to interface their alarm systems with their home routers through an RJ45 connections and a high speed internet service. These units do offer the client the added advantage of no additional monthly fees which cellular and GSM do not. Some IP devices are unique to a particular alarm manufacturer, whereas others will work with any make of panel, but with fewer features. We now have three units tested and ready to go for installation on demand for customers who have no conventional landline. Please bear in mind, these devices are ONLY as good as your IP connection and your router. If you choose to use this solution over an arguably more reliable and costly cellular Uplink 2530 device, we STRONGLY recommend as a minimum, backing up your router with a Universal Power Supply. No power, no IP connection, no monitoring services! 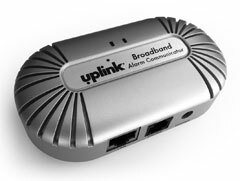 The convenience features of these devices also mandate that you have sufficient computer skills at least to the level of being able to access your network router on a browser, and understanding such things as DHCP, and how to reset up your router from scratch in case of having it crash, or if for any reason, you are forced to reset the router to default. The basic monitoring functionality will work regardless provided your internet is functional. Bottom line, in all security situations you must choose the level of security correct for your situation. Price, although always important, should not be the overriding consideration in your decision. Another prerequisite requirement for any of these technologies is to be able to physically run an ethernet line between your alarm panel and your internet router. That may not always be easy, or even possible in some cases. We will be adding further detail in the near future. In the interim, contact David Campbell at 613-227-1320 to discuss your particular situation. For use with the most modern of Paradox panels, this device is quite comparable to the Envisalink for DSC panels. Basic monitoring aside, the convenience features for remote access are quite good. Unfortunately the older lines of Esprit Paradox panels do not work with this device. Smartphone access via applications for purchase on the Android and iPhone app markets. ($10 as of this writing) Blackberry is not currently supported, but web access can still be achieved. This device will work with any panel that communicates in Contact ID format such as the Paradox Esprit series, Spectra series of panels, the Magellan line of panels plus the DSC 632 / 832 **series of Power panels and the new line of 1616 and 1832 panels plus the Alexor panels. Like all IP based solutions, it is highly dependant on a reliable internet connection and a quality router being in place, plus a Universal Power Supply to ensure the monitoring remains in place during a power failure. IMPORTANT NOTE: Paradox has just announced discontinuation of this device. This is a "leading edge" unit in the market, and as such, their decision amounts to a very major marketing mistake. Since we have been unable to convince them to reverse this decision, we can no longer offer this device for sale past our present stock levels; without an ongoing source of supply, we cannot reliably warranty this device. We have begn a renewed market search for a replacement unit. This device is somewhat different than the previous two, in that it has no smart phone access or other convenience features, but it will work with any make and model of alarm panel that communicates via Contact ID. This makes it a universal IP alarm communicator for any situation where the previous two units are not appropriate. Another advantage to this unit is ease of install. The other two units must be in the alarm panel container in the basement. This device can be wired with a single DEDICATED telephone wire and placed near the router if need be. This is sometimes (but not always) possible to work in situations where the router is on the second floor of the house and the alarm control panel is in the basement. Wired into phone network, added installation flexibility. Check back often as we continue to update this page with new products and services. We will soon have a very reasonably priced, full home automation package available for sale. Large numbers of customers are disconnecting their Bell or Rogers home phone lines without consulting us, and as a result, are finding themselves with alarms that no longer can communicate to the monitoring station over their new VoIP lines. As such, we are currently backlogged in installations of these IP devices, and cannot at this time promise you an immediate installation. Please bear with us until these paying customers are back on line, after which we can assist you. Thank you for your patience. Please note, use of any IP communication medium for your alarm assumes you have basic computer knowledge and are capable with making changes to your modem and router configurations, passwords, and generally understand the basics of internet protocol and DHCP. We will install your communicator and initially set up your router system to ensure communications to the station; however, we cannot act as network advisors on an ongoing basis. Should your router and modem not be protected against power outages by use of a UPS, and your router and or modem lose power, you may well encounter problems re-establishing communication with the station. We will gladly assist verbally, but should another visit be required to re-set router configurations, a $40 service call will be required. This is the sole exception to our totally free service concept.